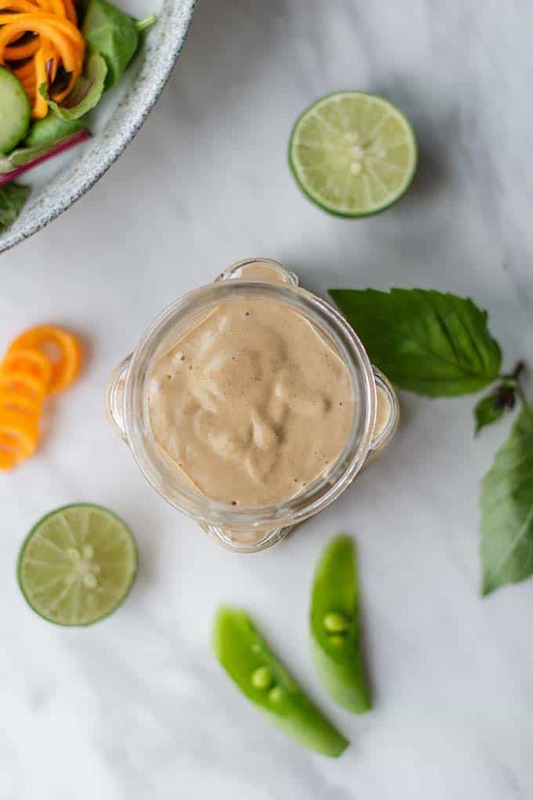 This Spicy Thai Almond Salad Dressing will have you craving salad! It’s seriously addictive. 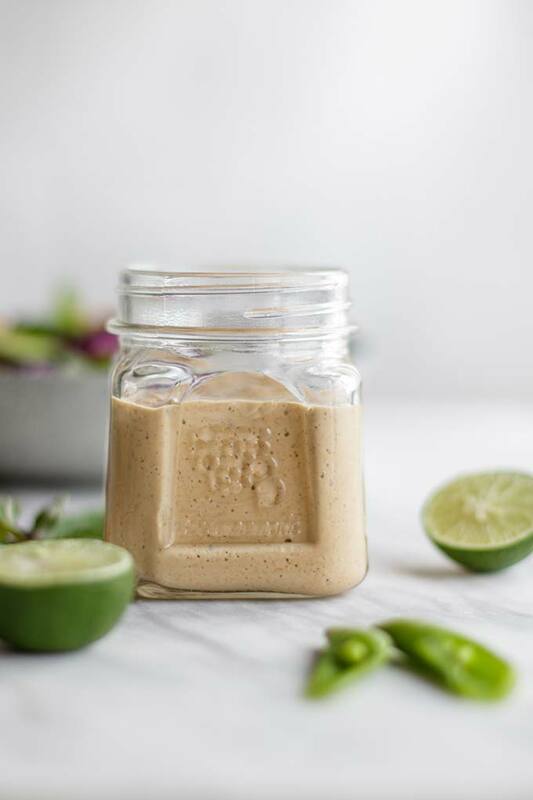 Creamy almond butter and coconut milk mix with sweet and sour Thai flavors for a dressing that’s truly unique! This is perfect for allergy suffers or anyone who avoids peanuts – a great peanut sauce with almond butter. This salad dressing is so good, it was in need of a spruce up. It was originally posted in 2014 – one of my first blog posts! And I have been making this healthy Thai almond sauce for much longer than that. I always loved the idea of peanut sauce — however, my life threatening peanut allergy prevented me from confirming the magic I believed it to me. That is, until I decided almond butter would make the perfect substitute. Thai cuisine is among my favorites — the lightly sweet sauces, coconut milk, the fresh herbs, ALL the ginger. This delicious salad dressing means you can enjoy your favorite Thai flavors every day if you’d like! How Do You Make Thai Salad Dressing? Thai flavors are bright and contrasted — so think salty, sweet, spicy and sour. This dressing ticks all those boxes. As far as I know, almond butter is not a common ingredient in Thailand. This salad dressing is a spin off peanut sauce, not an authentic recipe. In addition to almond butter, I use coconut milk. I love the creaminess and bit of tropical flavor that it adds. This Thai salad dressing gets it’s sour flavor from rice wine vinegar (yum!) and lime juice, some saltiness from the coconut aminos (or soy sauce), sweet from the honey and coconut milk, and spicy from the sriracha hot sauce. This dressing has caught on in the food-prep world — it’s the recipe that Instagrammers most often tag me for when they include it in their weekly meal planning. For good reason — these dressing makes a plain salad or some veggie sticks something you look forward to digging out of your lunch bag every day. This dressing is fantastic on pretty much any crunchy vegetable or side salad (makes an AMAZING veggie dip!). I love the spring roll taste, so I usually make sure I have cabbage, basil and cilantro to throw into the salad– a really great combo! Make it Gluten Free: If you use coconut aminos and not the soy sauce sub, this dressing is gluten free. Make it Paleo/Whole30: This dressing is fine without the honey, so simply sub extra coconut milk in place of the honey for a Whole30 compliant version. You will also need to use white wine vinegar in place of the rice wine vinegar. I feel it loses some of the authentic Thai flavor, but if you’re strictly Paleo, this sub will work. 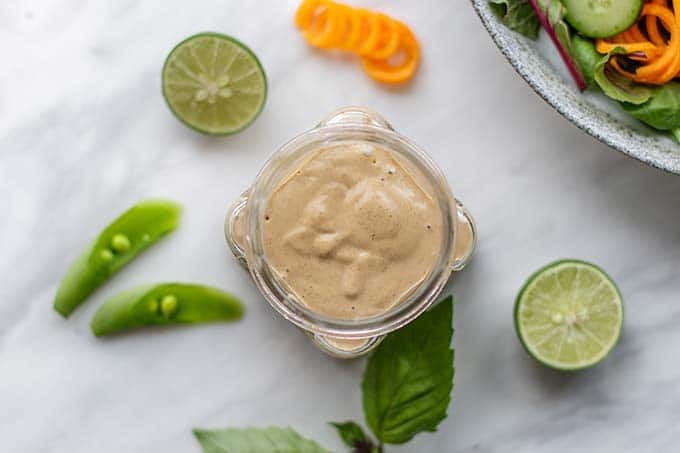 If you're a fan of peanut sauce, you will LOVE this salad dressing. Tons of creamy, healthy flavor to smother your greens. Caution: Will cause serious salad cravings! Add all ingredients (omitting the sea salt), starting with 1 teaspoon of sriracha (unless you know you love it spicy), to a blender. Blend well for 1-2 minutes, until mixture begins to lighten and looks well mixed (the coconut milk will make it get slightly "fluffy." Taste, and adjust seasonings to taste. Add more lime or sriracha if you love those flavors, and use a dash of sea salt to bring the flavors out more if desired. Store in the refrigerator for up to 4 days. Coconut milk does go bad quickly, so this dressing isn't something you can have around for a long time. If you'd like the dressing to be "pourable," bring it to room temperature and stir well before serving. The oils in the almond butter and coconut milk will softly solidify when refrigerated. 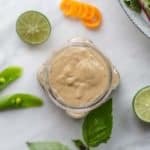 This Thai Almond Salad Dressing post contains affiliate links. If you click and make a purchase, I will receive a small percentage of the sale, at no additional cost to you. This helps keep Sunkissed Kitchen running and stocked with plentiful almond butter! I think I would just drink this sauce ;) Soooo good! 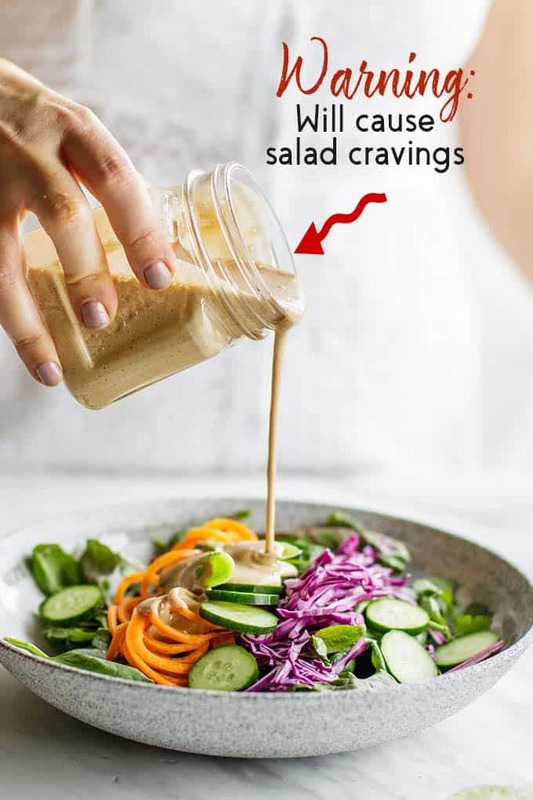 It's the one salad dressing I use with abandon :) I usually have to put more on like 3 or 4 times because I eat the spoonfuls off the top instead of mixing it in-- but almond butter, sesame oil, and coconut milk-- all healthy fats! Thanks Nagi :) This definitely has me looking forward to lunch again today! Wow, Michelle, I can hardly wait to taste this. The list of ingredients is fantastic. I'll be eating salads morning, noon and night with this. The girls are going to die over this at our next girls night and I'm going to torture them and not share the recipe....for at least a week, lol.Beautiful dressing and love the colourful photos! Thank you Robyn :) My girlfriends love this dressing as well-- funny though. They never ask for recipes. They ask to come over for dinner more! Haha-- my best friend asks often for "cooking lessons," which consists of me cooking, and her drinking wine and talking to me. Love the coconut milk in this. And anything that makes me "crave" a salad is awesome in my book. I'm always looking for ways to disguise my salads, not because I don't like salad but because I get bored so easily. This looks so good and I can't wait to try it! This dressing will certainly do the trick :) I generally use a lot of lemon juice, vinegar, and olive oil, but once in a while this is great to mix things up and make my salad not taste quite so healthy-- even though the ingredients are pretty healthy, they are so creamy it tastes pretty indulgent! Enjoy Arpita :) I always have all these ingredients on hand too- so much flavor! This Thai salad dressing looks amazing! Great combo of flavors! Will definitely make this! Pinning! Thanks Deborah! It's delicious -- thanks for sharing! Thanks for stopping by Gregory! I have never seen a salad dressing like this in Thailand... but it does have all those great flavors! Super tasty salad :) This dressing is to die for! Thanks for stopping by Marla :) Always good to hear from you. Just made this and it is sooo good! My changes I made were that I added a few pinches of curry powder and grund ginger. I also didn't have sesame oil at home so I just added a little extra Virgin olive oil. Tasted great! Thanks for letting me know Katie! I sometimes add a bit of fresh grated ginger if I have it-- the only reason I don't always is because the fresh ginger goes bad faster than the rest of the dressing. I should try dry ginger! I am sure the olive oil worked, but if you don't usually use sesame oil, give it a try-- so much flavor! Is there an alternate that might work for coconut milk? Almond milk? I am not against getting coconut milk, I just don't ever have it on hand (like now!) and I so want to make this for this week! Hi Amy! I have never made this without real coconut milk-- almond milk would definitely not work because it is mostly water. My best guesses at a sub would be something rich like actual cream. However, this dressing has a hint of coconut that is so delicious, and cream wouldn't give you that! Most peanut sauces (which this was inspired by) do not have coconut milk, so if you made it with water instead, you would probably end up with a more traditional tasting sauce. Whatever you try, let me know how it goes!And then... next time you're at the store, pick up some coconut milk! I know in the States you have to buy a whole can, and if you don't regularly use it, it goes bad quickly. What I do with whole cans is freeze what's left over, and add to smoothies- super delicious!